We are back in business. Hurricane Irma paid us an unwelcomed visit September 5,2017 and caused minor damage to the property. We took this time to to give our home a redo. The house has been painted in and out, furniture has been replaced and a beautiful deck has been added. Also a convenient kayak rack was added. This beautiful, duplex home is located on one of the only private beaches in the Florida Keys. The home is located on the southern tip of Long Key, and has a spectacular view of the Atlantic Ocean. Each side of the home is a two-bedroom, one bath. Both sides are available for rent. Other side can be found at VRBO #620321. It is ideal for two families, and a paradise for adults and children. The Long Key State Park is a short walk up the beach, where camping, birdwatching, snorkeling, hiking, canoeing, and many other activities are offered. The water in front of the home is shallow, with a channel which enables a boat up to 30 feet in length to reach the dock. The shallow water is great for snorkeling, lounging, and is a paradise for children. Boat rentals are available nearby. The waters of the Atlantic Ocean and Florida Bay provide some of the best diving and fishing in the world. World-Class fishing guides and dive boats are also available. Many of the local fishing guides will pick you up right in front of the house. The Long Key Viaduct, just a few hundred feet from the house, has proven to be one of the world's best places to catch a Tarpon. Both sides of the home are fully-equipped with linens, kitchen supplies, patio and beach furniture, a barbecue grill, and a tiki hut provides an escape from the warm Florida sunshine. Come to enjoy some of the many attractions that the area has to offer, or just lay in a hammock under a palm tree. There is something for everyone at this beachfront paradise! The home is located on the site of Henry Flagler’s Long Key Fishing Camp and it’s where author, Zane Grey vacationed and wrote some of his works in the early 1900s. Long Key Fishing Camp was established on Long Key in Florida in 1908 by Henry M. Flagler's Florida East Coast Railway Company for the use of tourists to enjoy what was described as 'some of the best fishing in the world.' It initially served a housing for some of the employees who were building the Overseas Railroad to Key West. Long Key Fishing Camp featured a two-story hotel and a number of cottages. The camp was made famous by author Zane Grey, who was a regular resident, and a pioneer of the sport of sail fishing. Grey became the first president of the Long Key Fishing Club in 1917. The list of other early distinguished guests included Herbert Hoover, Franklin Roosevelt, Andrew Mellon, Charles Kettering, and other notables. fell in love with Long Key in the mid 70's i have been an avid fisherman and diver since I was young and searched for years for a special spot to spend on the water. I keep the boat in front of the house and be tarpon fishing within 5 minutes or I can go fly fishing for bonefish in 1 minute to10 minutes. If I decide I would like to lobstering it will take a 5 minute boat ride to go searching for dinner. The opportunities are endless! Our home sits on the same property as the historic Long key Fishing Camp. See details below. No need to leave the property. Swim, kayak, paddle board, sun, snorkel, fish, birdwatch, walk the beach, watch beautiful sun rises and sunsets from the dock, and much more all on site. Step out the back door onto one of the largest private white sandy beaches in the Florida Keys. 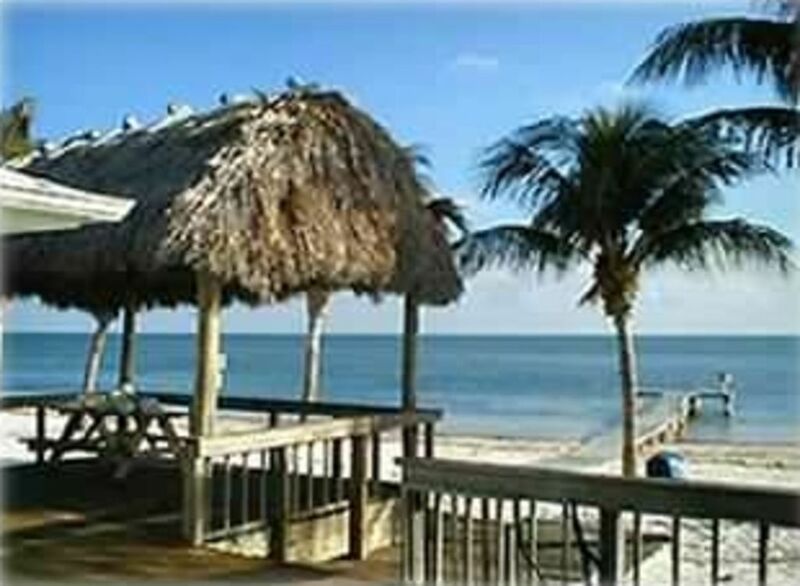 A large deck, including tiki hut allows guests to relax or dine under the shade while enjoying oceanfront views. We had a fantastic time! The house was spotless and the perfect size for my wife and kids + father-in-law. There was enough room in the 'master' for a toddler air mattress + a cot on the floor for the kids, though they could have slept on the pull-out sofa. We spent each morning on the deck drinking coffee while the kids played on the beach in their PJs. The amount of stars you see from the deck on a clear night is INSANE. It is a great location (easy to get to both Islamorada and Marathon), but definitely feels rural. Unlike previous reviewers, we had no issues with cell/data reception (for what that's worth). Can't wait to get back!! This private piece of sand on the Atlantic Ocean was perfect for us. My husband was able to walk the shallow flats to flyfish as well as catch fish from the end of the pier. Our dog and I lounged on the beach every possible minute. The tiki huts, sunrises, sunsets, beach furniture, games, grill, were all that we needed to soak in every minute of the Keys' winter warmth. The home is clean, comfortable, and provided all we needed and host, Bill, was friendly and accessible. Thank you very much for the wonderful response, we are constantly striving to insure our guest have a memorable stay at our beach house. If you're looking for a quiet, comfortable spot for a real on-the-beach vacation, this is it! We saw eagles, rays, sea turtles, and even a few small, passive sharks who were uninterested in us. The beach was clean and worry-free and we spent many hours paddling and relaxing on the dock or under the palapas. The house had everything we needed and was in top condition. The owner was especially responsive and made it easy for us to get the most out of our stay. It's really hard to think of any cons for this property. We wanted to help tidy up the already clean beach from new surf debris, but couldn't find any extra trash bags...might want to bring some if you're so inclined. Also stock up on mosquito repellant...no fault of the property, but they're swarming all through that stretch of the keys. We would love to have stayed longer and will definitely be back! I was a little skeptical at first but this house was awesome! Wife and I stayed the weekend. Perfect for kids too. We will be back for sure! This location and the home we stayed in couldn't be better. Beach, patio, dock all suited our needs. It was a restful and wonderful vacation. The weather even cooperated. Guest with pets /refundable security deposit should be paid separately by check or credit card and will not be deposited unless damage has been noted and discussed with guest.